Sweater weather. Wool sweater weather. I pulled on my woolliest sweater and headed for the woods psyched because I’m a newbie at King County Parks and knew there’d be something among the trees about which to Plog. The week before, I met the field crew who takes care of the parks in northeastern area of county, and asked them for their favorite spots to visit. 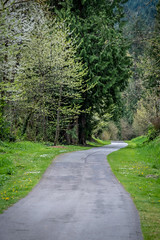 Near the top of the list was 320-acre Ring Hill Forest, located east of Redmond and west of Duvall, with the promise it would be beautiful and peaceful. They weren’t kidding. There was a subtle downhill at the start after a patch of craggy rocks, then a pleasant meander along the forest’s outer loop, where near the end, there was a slight incline my own creaky knees found easy to manage. My FitBit logged a 2.5 mile stroll accomplished in an unhurried hour. Bigleaf maples had shed their enormous leaves over the trail and bordering shrubs, making it look like the confetti aftermath of a forest celebration. I noted several woodpecker-pocked snags and a bunch of old growth stumps leftover from the first harvest done in 1911 by the forest’s namesake Tom Ring. According to the forest’s stewardship plan, there was another tree harvest in the mid-60s. By the time the county bought the forest, it was full of “undersized, deformed and/or diseased coniferous and deciduous trees standing.” The plan calls for keeping Ring Hill a working forest wherein a harvest every ten years or so will thin out the dense areas and make room for more light and plant variety. While Ring Hill looks like lush habitat for wildlife, aside from the occasional birdsong, the only evidence of critters I saw likely belonged to the sweet pup loping alongside his owner on their way out; I found paw prints in mud soft from the morning’s rain. There were a few crossings over babbling streams that “supply clean cool water to Tuck Creek and the Snoqualmie River. The forested landscape and wetlands serve as a sponge, slowing and purifying rainwater and metering it down the stream system” again, according to the site’s stewardship plan. If you’re looking for a peaceful spot in nature, a stroll through Ring Hill Forest might be just what you’re craving. Various web reviews of the forest say the trails are great for easy trail running, and others bring their kiddos, so there may be times when you have to share the woods with others. You’re going to be so chilled out though you probably won’t even mind. Note: Parking at the trailhead is limited to a few cars. There are no potties. Dogs must be leashed.